In our last blog, we discussed top tips for coping with the many sensory experiences of the beach. In this blog, we share some additional tips in relation to this. Think triggers, sunscreen and even canvas shoes…. Sudden loud noises such as lifeguard whistles, children calling out and ice cream truck bells. This is a hard one to prepare for. It can be overcome by noise-cancelling headphones, if that is something your child has used before. Otherwise, talking to your child about how unexpected noises can happen at the beach and exposing them to some of these, possibly through YouTube (another great resource) will gradually desensitise them. Going to the bathroom. 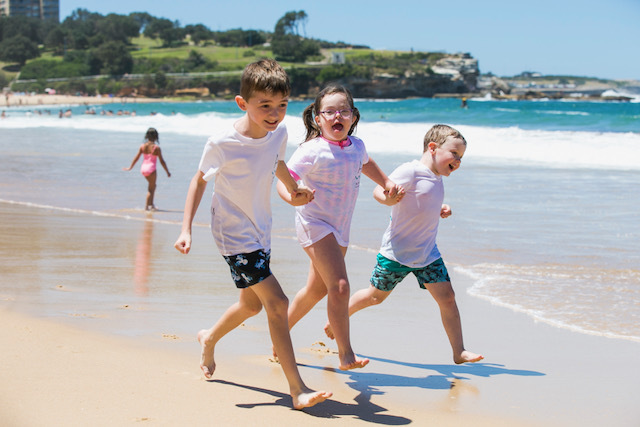 Know the location of the bathroom (the Toilet Map provides information on over 16,000 publicly available toilets across Australia, including accessibility, opening hours and facilities, such as showers & baby change - https://toiletmap.gov.au/) and try to find a beach location close to a restroom. If you are going to buy food from the kiosk, waiting in line can be a tedious task. I recommend having a small toy or item of interest that your child can have during this time. First trip to the beach? Go to the beach early in the morning when it is less crowded and let your child experience the sensory sensations without the commotion of crowds. Sand is still not your friend? Trial wearing a pair of canvas shoes. Your feet have 7,200 nerve endings on the bottom, so this might help deter the over-stimulation from the sand and its intricate movements. Also, the sand can get particularly hot in the peak of summer, so a little extra protection is always good. Practice sun protection techniques (applying sunscreen, wearing hats, having a swim shirt on and it being wet) so that when you get to the beach this is not another thing to have to worry about. There have been many changes to sunscreen over the years, it can be unscented, reduced greasiness and can come in spray versions. Applying sunscreen is also a great opportunity to give your child some deep pressure, which is calming and organising, before going into the stimulating environment of the beach, ensure you use firm even strokes. Be clear on how long the activity will last. Always include starting and finishing point. By clearly defining that ending point you are helping your child feel some control over their environment.